When students are unmotivated to learn or become disengaged, it becomes increasingly more challenging for students to meet the expectations and the rigor of Common Core State Standards with success. Many students resort to disengaged or disruptive behaviors which affect the overall classroom climate and the effectiveness of teaching and learning. Click on the image above to view presentation. In 2015, NAEP data show that, only 36% of students in grade four scored at the Proficient or Above Proficient range in English Language Arts standards. In California, only 45% of grade four students met or exceeded the English Language Arts standards in 2015 as measured by the California Assessment of Students Performance and Progress (CAASPP). 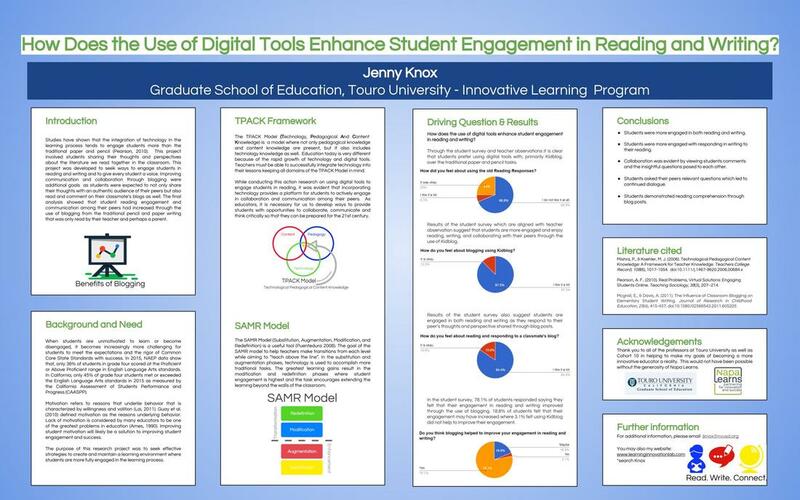 The purpose of this research project was to seek effective strategies to create and maintain a learning environment where students are more fully engaged in the learning process.